In an early game of the 27th game in the English Premier League, Pep Guardiola celebrated with Manchester City a 2-0 away win at Everton FC. Due to this success, the reigning champions took over the league lead, thanks to the better goal difference against the Klopp team. However, the Reds have completed a game less than the Skyblues. This weekend is the 26th game day on the program. An interesting duel between two neighbors is the match between Watford and Everton! Only by one point are the Hornets and the Toffees currently separated and ranked with 34 and 33 points on the places eight and nine. In the direct duel, it’s all about keeping the connection to square seven. After all, depending on the outcome of the two cup competitions, it could eventually be enough for Europe. However, both teams urgently need a full success. The bookies see in the duel between Watford and Everton according to current odds, the home side slightly in the role of favorites. The start of the game at Vicarage Road is at 4 pm on Saturday afternoon. After the outstanding start of the season – four wins at the start – the expected slump came in the autumn, before the Hornets presented themselves in recent weeks again from a much better side. The team of Spanish head coach Javi Gracia has lost only the away game of the last six league games at the Tottenham Hotspurs. However, there is only one victory in this period, the points have been shared four times. Meanwhile, the team from the London suburb has a fully balanced 9-7-9 record. Nevertheless, the dream of Europe is by no means unrealistic, the residue on rank Seven is only three points. In addition, Watford is still represented in the oldest cup competition in the world, the FA Cup. But before the away game at second division Queens Park Rangers next weekend is on the program, Watford wants to write again in the league. Watford had to settle for a goalless draw with Brighton & Hove Albion last weekend. For the second time in the recent three league games ended a Watford match scoreless. The hosts have now scored as many goalless draws in three games as they did in 57 Premier League games before! Last but not least, the defense was quite solid, but the offensive game seldom produced any danger. With six goals, Argentina’s Roberto Pereyra, a central attacking midfielder, is the top scorer. He has scored five of the 16 home goals. However, he missed the squad this past weekend against Brighton & Hove. The lack of a top striker is not to be dismissed out of hand. In view of this, odds on the under 2.5 could be an interesting option in the game between Watford and Everton. Even the ambitious local rivals of Liverpool FC may still dream of Europe. However, according to our prediction, the duel between Watford and Everton puts much more pressure on the shoulders of the toffees. After a 2-0 defeat by Manchester City, Everton has completed a game more than the direct competition for seventh place and still five points behind. A loss of point or even a defeat could leave the dream of returning to Europe a long way off. In addition, Everton presented by no means the best side in the last two months. Everton has won just three out of 13 league appearances since the bitter last-minute defeat of Liverpool in the Merseyside derby on 2 December (hair-raising Pickford error in the final minute). Negative highlight of the last weeks was the FA Cup against Millwall. With this balance, a qualification for Europe is not possible, the turnaround must succeed quickly. After all, there was a victory in the last Premier League away game (1-0 against Huddersfield). 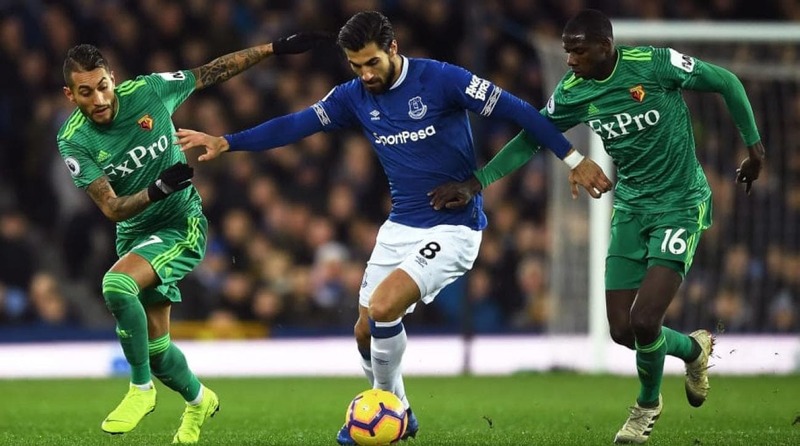 Should the Toffees refill on Saturday, Everton would win for the first time since September 2016, two Premier League guest appearances in series. In the game between Watford and Everton a tip on the guest delivers odds up to 3.40! An explosive game will be the duel between the two teams on Saturday afternoon, mainly due to the hiring of Marco Silva. The Everton coach was dismissed by Watford in January 2018. He will not get a nice reception, since the fans at Vicarage Road accuse him of lack of loyalty. During his tenure at the Hornets, he negotiated with Everton for a transfer. Many duels between the Hornets and the Toffees are not yet found in the database. So far, the two teams have faced each other so far: in addition to 23 games in the Premier League, they also played two games in the FA Cup. The direct comparison speaks a clear language in favor of the elf from the Merseyside. Everton has won no fewer than 17 of these 25 games, with the remaining eight games split into four Watford wins and four draws. In the first match of the season, a free-kick by Lucas Digne in injury time ensured a lucky point win for the Toffees! On Saturday afternoon, two teams face each other at Vicarage Road, both of whom are still dreaming of qualifying for the UEFA Europa League. However, both the Hornets and the Toffees have to fire the turbo again in the finish of the current season. Indeed, with last week’s balance sheet, Europe will only be a dream. In the direct duel it comes to the connection to the seventh place in the table, a victory is urgently necessary. The bookmakers regard the game between Watford and Everton as the most likely outcome of their home win – the odds are 2.34! Two of the last three Premier League games ended scoreless! Everton has won 17 out of 25 duels against Watford! The toffees in freefall – only three of the last 13 games Everton has won! However, we find a forecast on the three-way market in this game extremely difficult. Arguments for Watford would certainly be the facts that the Hornets could win the last two home games against Everton and the home advantage. The guests, however, have the qualitatively slightly better squad available, but only rarely convince. Both teams had problems in the last few games, especially with the graduation. In the game between Watford and Everton are offered for the tip on the under 2.5 odds of 1.98. Here we would probably have expected a maximum of 1.80-1.85. So we see in it so the value and make on the under 2.5 use of four units!